As a brand, one of DORIN FRANKFURT’s goals is to create luxurious basics that embody relaxed elegance. 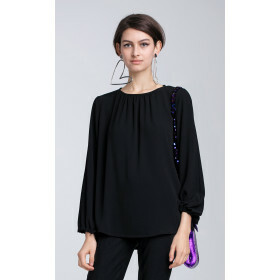 This graceful blouse is adorned with a gathered neckline and slightly puffed sleeves finished with a tied bow. The timeless top will work well with tailoring and denim. Model is wearing size 1.